Karyn and I went to the Disneyland staff Christmas Party. I think this is the most beautiful photo of Karyn. We waited in line to have our photo taken with Snow White (my Mommy's favorite princess). They did a switch-a-roo on us and we ended up taking one with Princess Aurora, our least favorite princess (she wears pink). We were so disappointed. 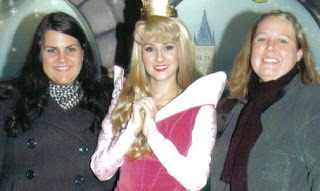 Princess Aurora even apologized to us for not being Snow White. The photo is CLASSIC. Horrible but CLASSIC disappointed Karyn and Kat. Disappointed at the happiest place on earth. I love that she wears pink - but her name reminds me of toilet paper. And she didn't even do anything but sleep. Snow White at least ate a yummy apple and lived it up with 7 men before settling down. That's my girl! LOL!